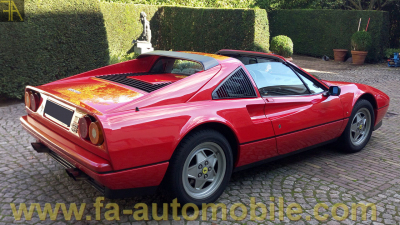 Superb 328 GTS delivered new in Italy and having only 2 owners only. Rosso Corsa interior black, it has only 34,500 km of origin and is accompanied by its maintenance book, complete invoice file at Ferrari. The belts were changed in December 2015 and the car has only little rolled since. The car is now in Belgium, it is equipped with a Tubi exhaust, which gives it an exceptional sound. It is rare today to find a 328 in such a state of origin, never repainted, without scratch and with such a low kilimeter. Available immediately.